AdSense optimized WordPress themes have seen a boost over the years, as developers noticed the shortage of these types of themes and delivered. All the themes presented below have been engineered and crafted to increase the click-through rate by having better ads placement and an evenly proportioned content to ads ratio. Of course, you have to keep in mind that the content is always the most important and if you have to have amazing content to keep your audience entertained and loyal. Using an AdSense optimized WordPress theme is the ideal choice for small bloggers and magazine websites looking to earn profit while also gaining momentum. These themes do not demand you to have previous technical or coding knowledge. They are user-friendly and intuitive built with highly customizable theme admin panels. Let’s dive in and check out the best AdSense optimized WordPress themes on the market. 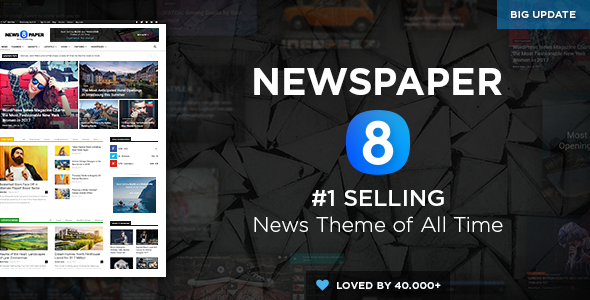 NewsMag PRO is a modern, sharp, excellent, fast-loading, magnificent premium WordPress theme. NewsMag was primarily designed to serve as a platform for blogs and magazines but it can fit a variety of niches. You can easily add ads on the homepage through widgets, AdSense, and banners. This is an incredible theme that will improve your business and help grow your income steadily. You can make it look exactly like the demo through a one click demo installation that takes seconds. Your readers can be reached on mobile devices as well because NewsMag is 100% responsive. Get it today! Few AdSense optimized WordPress themes are better than Goliath. This theme is impeccable in its design and functionality leaving nothing to chance. With Goliath you can edit and create layouts using a drag and drop page builder and then enhance them with mega menus, sliders, video content, Google ads, sidebars, and custom footers. You also do not have to worry about your foreign audience because Goliath is translation ready and support RTL. If you are getting lost in all its amazing features you can consult its informative documentation or reach out to their support team. A great platform! 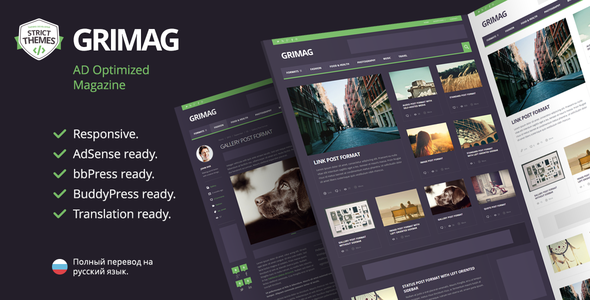 Grimag is a spotless, sophisticated, elegant, and polished AdSense optimized WordPress theme. Grimag was purposely crafted to be the ideal option for people looking to make money through their content and ads. This theme is highly versatile and to showcase that is comes with different skin colors, posts and pages layouts, custom widgets and shortcodes, unlimited colors and sidebars, and more. It includes a lot of great ad placements that will blend through the content and not tire viewers. Let your ad revenue flow with Grimag! As you might gather from its name, Admania is among the best AdSense optimized WordPress themes. It comes with a gorgeous and modern design, a 100% responsive layout, cross-browsers compatibility, and SEO optimization. Admania will invite shyly invite your visitors to read your content and then keep them hooked and entertained for hours. This theme is packed with a live editor, several pre designed layouts, WooCommerce integration, extra ad placements, gallery post ads, mobile ad design, ad block detector, RTL support, and a couple of page templates. Be sure to check this theme out! Choosing from the get-go the ideal theme for your business will make all the difference in the world. Gillion is a theme you will not regret purchasing because it is flexible, multipurpose, completely responsive, and Google AdSense optimized. Gillion is packed with amazing features that can be applied to a large variety of niches. Just to give you a taste, it comes with over 40 design elements, bookmarking and reviews systems, integrated Visual Composer, more than 10 custom widgets, and more. If you need inspiration you can check out its 14 pre-built demos. Try Gillion! CheerUp is a reliable, cheerful, able, brilliantly designed, and responsive AdSense optimized WordPress theme. It is the perfect choice if you are looking for a versatile theme. CheerUp comes with 500 homepages you can choose from. Yes, you read that right! Apart from having so many stunning demos, it also includes dozens of header styles, sliders, creative footer layouts, social integration, Visual Composer, and WooCommerce integration. With CheerUp you have full control on your pages’ layout and you can let your creativity flow and design something inspiring and engaging. Get it today! Jevelin is one of the best AdSense optimized WordPress themes you can get without ifs and buts. Jevelin is highly customizable and it comes packed with tools and features you can play with. It has features for days including an element editor, 40 shortcodes, creative demos, Slider Revolution, various templates, mega menus, social media features, and a shop option. Furthermore, Jevelin is completely responsive, RTL supportive, and cross browser compatible. If you still have doubts check out its beautiful demo! MagPlus is a daring, elegant, fresh, clever, and responsive AdSense optimized WordPress theme. It is extremely flexible and professional ideal for developing unique websites. With this theme you do not have to know coding or have experience before-hand. It is very easy to install and comes with a one click demo content importer. MagPlus packs more than 40 demos, a dozen of header styles, 150 pre-designed elements, various article layouts, and 20 responsive sliders. Take your website to the next level with MagPlus! 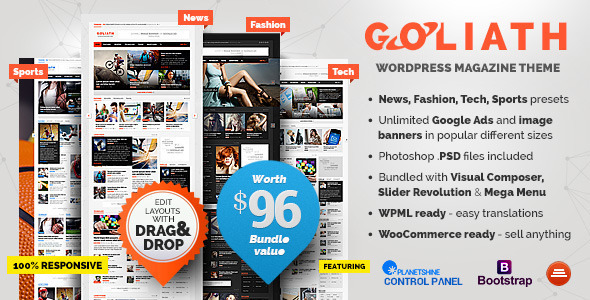 Goodlife is a great addition to this list of AdSense optimized WordPress themes. Goodlife comes packed with loads of highly customizable demos and layouts, pre-designed article pages, gallery and video pages, shop pages, essential premium plugins for free, sharing buttons, and loads more of design elements and customizations. Given that ads are a great way to increase your earnings, Goodlife is packed with several great ad placements. An indispensable partner for your business! If you are a business owner or blogger and are looking for professional AdSense optimized WordPress themes then look no further than Newspaper. Newspaper is the kind of theme that will take care of everything for you without overbearing you with information and tools. This theme includes a unique page builder you can use to create and personalize headers, footers, page layouts, and much more. Apart from being AdSense optimized, Newspaper is also Google AMP ready. You also get unlimited typography and color choices to play with. 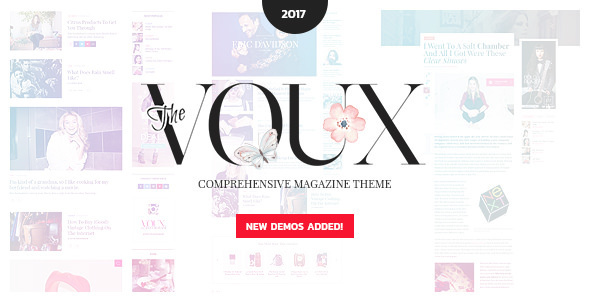 The Voux is a clever, eye-catching, intuitive, completely responsive, and appealing WordPress theme. The Voux is extremely flexible and was developed to enhance websites through its creative design and immense functionality. Using The Voux allows you to create beautiful designs for your business without any previous experience in web development. This theme includes stunning demos, Visual Composer, shop layouts, posts layouts, social sharing integration, infinite loading, and a real time guide-through. Present your business to the world in style with The Voux. Are you ready to take the world by surprise with Sahifa? This theme is spectacularly built and designed. 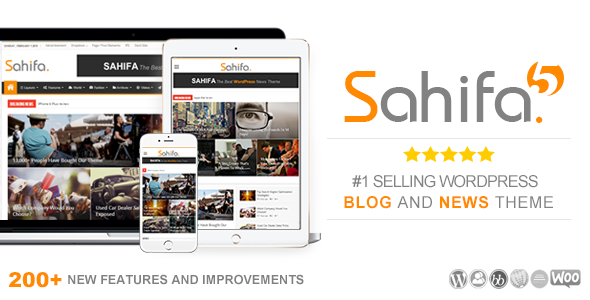 Sahifa is equipped with user friendly and intuitive features such as 400+ layout options, a built-in drag and drop page builder, RTL support, content slideshows, custom menus, live search, full responsive design, and several integrated premium plugins. With this theme you have great diversity to create unique pages and posts without breaking a sweat. Revolutionize your business and give it a much needed push with Sahifa! Ramble is truly one of most popular and powerful AdSense optimized WordPress themes. It is incredible in each and every way starting with its over 100 blog demos you can choose from to get you started. If that is not enough, you also get 50 magazine, portfolios, and shop demos. Additionally, Ramble also allows you to change the header and footer styles, add custom menus, change the layout, add custom widgets, add menu icons, change the pagination style, and so much more. Ramble is adaptable to any business and niche. Check it out! In the online world design matters just as much as content and with Herald you can get the design part off your mind because it has you covered. Focusing on the content will help you create unique an interesting content thus propelling your business forward. 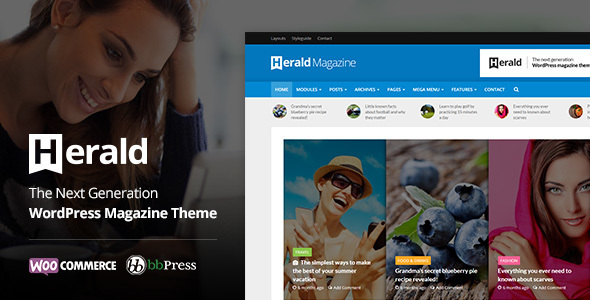 Herald has incredible skills you want to take advantage of such as limitless post layouts combinations, flexible image sizes, modular header, banner ads, rating plugin, shop page, responsive design, and unlimited sidebars. Using all these features you can develop a cozy and simple or bold and colorful website. The choice is yours! Try Herald and give life to your ideas. True Mag is a stunning, competent, reliable, resourceful, and bold AdSense optimized WordPress theme. The team behind this theme artfully combined professionalism and quality to craft this beautiful piece of art that True Mag is. It is the perfect option for beginners because its theme panel is highly intuitive and easy to use. With this theme you get free premium support, a complete documentation, slide styles, homepage demos, video advertising plugin, membership plugin, and navigation layouts. You can construct your own layout in minutes without writing any code. All in all, True Mag is a great and solid theme. 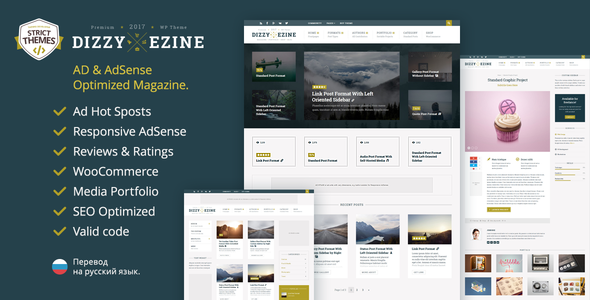 Dizzymag is an aesthetically pleasing, dazzling, qualified, witty, and responsive premium AdSense optimized WordPress theme. This theme has been gifted with useful options among which are ads hot spots, reviews and ratings section, shop page, portfolio, page templates, 140 custom icons, sidebars, unlimited fonts, demo content, documentation, and custom widgets. Dizzymag is a professional solution for bloggers all around the world that are willing to put on the work it takes. Stay ahead of the competition with Dizzymag! Weekly News is polished, smooth, alluring, tantalizing, and engaging theme. 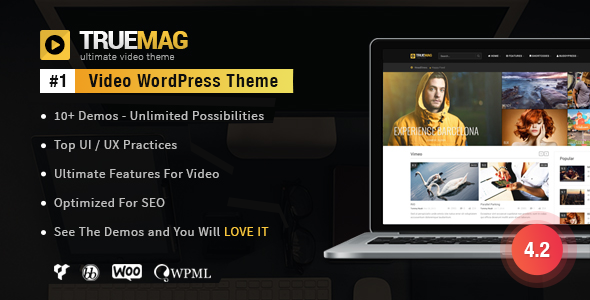 This powerful AdSense optimized WordPress theme will assist you in creating a gorgeous and intuitive website for your blog or magazine. It does not matter the niche you want to dive in because Weekly News is designed to fit all of them. With this theme you can create one of kind post layouts using Visual Composer, create efficient mega menus, manage your ads, use custom widgets, translate it, create sidebars, and so on. 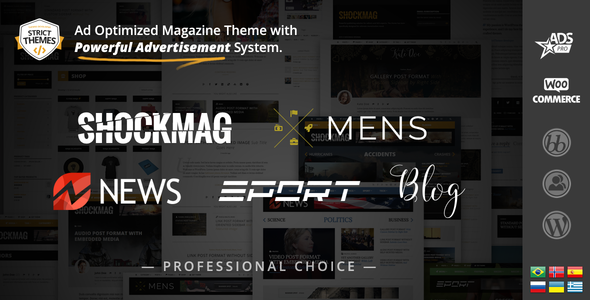 Shockmag is without question one of the most potent AdSense optimized WordPress themes you can find. This theme uses its beautiful design to the maximum to compel your readers to spend more time browsing the website. Shockmag is a theme constantly upgraded and improved adding new features and tools. In their last update an Ads manager was included along with mega menus and 5 new header layouts. Additionally, Shockmag is loaded with beautiful content sliders, menu icons and drop-down menus, blog templates, customizable categories, and skin schemes. If your website needs a makeover and a boost then look no further than Solidus. This theme is laid out perfectly and designed to perfection by a team of elite authors. You can immediately tell the passion and work these developers have put into Solidus making it a solid and professional AdSense optimized WordPress theme. Solidus presents the user with more than 20 WordPress shortcodes, custom widgets, review sections, mega menus, responsive slider, smart sidebar, gallery system, and ad banners manager. Solidus is the theme you need! 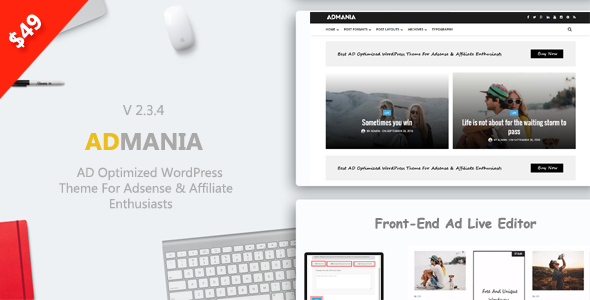 Closing our list for the best AdSense optimize WordPress themes with Jannah. Jannah is a stunning, excellent, magnificent, and necessary theme for any blogger or web master looking for a great theme with spot on ad placements. With Jannah you can choose between 7 header layouts, send web notifications, highlight your content, showcase the daily weather, add ads all over the website, or use the pre-made demos. Make sure to check out its live preview and see first-hand how incredible this theme truly is. There you have it, the 20 best AdSense optimized WordPress themes. These themes will help you maximize your ad income and make a steady revenue while doing what you love. Do you know a great AdSense optimized theme that might fit our list? Let us know!